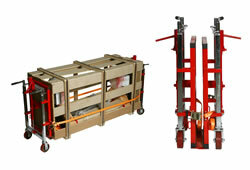 The WARRIOR Safelift is the ultimate equipment for alleviating problem on site handling issues. It allows professional transportation of heavy and awkward loads like safes, cabinets, switchgear, vending machines, machinery weighing up to 1800Kg. They can be easily transported around due to their low individual weight 43Kg. The lifting toe is fitted with a rubber covering to eliminate slippage. Units are finished in orange powder coating and zinz chromate. Mounted on non marking polyurethane swivel castors all round. Wheel – polyurethane (mm) 150?